A friend has just begun blogging, and her blog is looking good! Check out A Homeschooling Thespian! No matter how old the kids are, they enjoy visiting with Granny. Today was no exception! They took a dip in the pool. The horse-next-door came over to say "hello," and to nibble on the day-lilies! This one is shot clear through. They thought wind-chimes might be excellent targets too, and they were! Wind-chimes give you a nice melodic "ping-dong-ding" when hit. 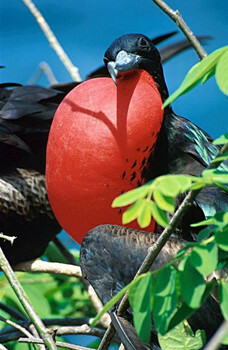 Here is a photo (from clipart.com) of a frigate bird. When Don and I were honeymooning in Mexico 20 years ago, we saw many, many frigate birds. We were impressed by the male's display of his beautiful, inflatable red chest pouch. Annika receives a merit award for outstanding achievement. Trip gets a certificate for completion of advanced studies in German. He also received a certificate of recognition from the German consulate. Of the beach at sunset tonight. Note the tern near the break in the clouds. Who says lab science is a problem for homeschoolers? Soap dish trays, alligator clips, some 9 volts, a bit of agar, buffer, natural dyes from plants (we used peppers), and there you have it...after several trials and some burned runs: Electrophoresis at home! Head over to Cottage Blessings for more photos and videos, too. DON"T miss the first video of the impromptu choir performance. Trip began by helping the little ones on the zip-line. Then his brother and friends got him wet. When Trip jumped into the pool, the little ones were forlorn. Where two remoras disguised as children attached themselves to him. And he didn't mind one bit! Hey folks! The Aspen Festival Orchestra will have their performance broadcast live online tomorrow night on Medici TV. This is a free program, if you tune in at 6pm eastern time, 4pm mountain time! Look for Libby--she'll be sitting third stand in the second section (I think). The theme for the Festival this year is "Fairytales". Music for tomorrow evening includes a world premier of The Great Gatsby Suite by John Harbison. Other music, like tonight's performance by the Takács Quartet, will also be webcast, and includes Schumann's Fairy Tales, and more. With Libby gone, Annika is taking advantage of her new-found space. First, she moved Libby's bed to the hallway, calling the hallway "Libby's new room." "After all, "Annika continued, "Libby will only be here a few days before she goes to college." There is just enough space for the bed, and it has a nice closet. Annika decorated the wall with a sarong from Bali. There is a window and an overhead light. A small desk attaches to the side of the bed. She made the bed, and put pillows and stuffed animals on the end. It actually works. The puppy likes it. Then she went through the clothes, choosing which of Libby's things she likes the best. She has promised to keep all borrowed items in good condition. Extra blankets and sleeping bags are hung neatly in the cedar closet, along with winter sweaters, recital dresses, and other rarely-used items. She organized all other items, and set up a desk for herself, with an electric keyboard for composing nearby, and plenty of room for school work. Pencils and pens, art supplies and manuscript paper are all organized well. She has a recorder collection, and I heard the sound of recorder music wafting through the house every time she took a break. She hung scarves on either side of her doorway, left and right, on sun and star curtain rod holders, for a very elegant entryway. There are maps and original artwork on the slanted walls (it's an attic room). She organized the two built in book cases with dolls on one level, and books on the rest of the shelves. But after all the books were organized...There was no room for the CDs and tapes. This is how I can tell she is growing up: She filled her old wooden doll cradle with the CDs. Well, they fit...sort of, and it's a bit of a design statement. The Long Island Catholic has a nice piece (it should, though, shouldn't it??) about our local confirmandi being confirmed in the traditional Latin Rite. Nice is too tame a word. This was sublime. Thank you Bishop Murphy! Last weekend Trip made his first appearance as principal cellist with the NY YME. Yay Trip! There he is on the far right. Congrats to all the members! Unfortunately, the hot weather we had last week has made the mulberries a bit dry and miserable-looking. I am hoping for a lovely cobbler tonight, though. But there are enough mulberries for more than just a cobbler, so I decided to look up more recipes. I found a great website called Mulberry Madness. It has some interesting recipes to try, for sure. Tonight, though, it's cobbler. Meanwhile, I am in the middle of a laundry dilemma. My dryer is not functioning, so I have been hanging out the clothes. Unfortunately, half of my clothesline is under the mulberry tree, so I have to be very careful where I hang the clothes, both because of the staining properties of the berries, and the droppings of the birds who love to eat same. Yes, wasps are eating my clothespins. I must be very careful to avoid the painful sting of these inhabitants of my back yard. I'm not allergic, but I don't like to be stung--laundry is a dangerous business! An early drive to the airport for a flight this morning, a quick "goodbye" in the car, and that's it. She should be nearing her destination 'bout now. Sometimes motherhood is so bittersweet. This is her third year going to the music festival, but this time, when she comes home, she'll be coming home to her college dorm room, not her bedroom at home. I think that's the difference this year. Also, she turns 18 while she is away. So we sit here, considering the price of gas vs. seeing her sometime over the summer. I think I'll go clean her room. in Aspen. Or at least it was this morning. I'm rethinking Libby's packing plan. I hear they are keeping the slopes open through this weekend, and she wants to go snowboarding. Um...no? Somehow, I think that snowboarding might not be compatible with a music festival. It's a pretty place either way...see? Aspen Live Cam. "Don’t blame kids for having a hard time reading. Blame the English spelling system, says a new study. Words like foreign, rhinoceros, vomit, tourist, heaven, spinach, ghastly, and tongue are among a long list of words that confuse children because they contain letter combinations that are more commonly pronounced in different ways..."
Read the rest in School Library Journal. It's that time of year. Libby is heading off to play at a summer music festival. Last year, she packed 29 shirts. She took Annika's new-and-never-before-worn shoes. She ordered boots online to be delivered to her apartment. In all, her luggage was 20 lbs. over the limit. This year we are helping her to pack less. Yeah, it'll mean she'll have more laundry to do this year, but I think it'll be a good lesson. Note: Packing is best done with coffee.